​​Review the eligibility guidelines below, and make sure you can say “yes” to these statements. ​ If you are unsure whether you fit these criteria, please contact us to discuss further. Does your community project include aspects of food, culture and Community Economic Development (CED)? Culturally-appropriate food-related CED and Cultural Reclamation is our focus. Are you in the north? 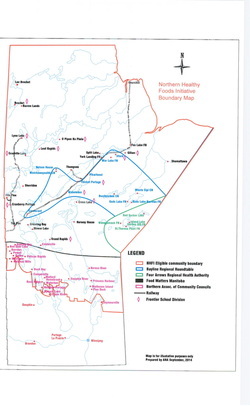 The project must be north of the Indigenous and Municipal Relations Boundary (see map). Does your project benefit a group of people? We support people and believe in the strength of community. We suggest at least 15 families/households participating. Does your community experience﻿﻿ economic and food-related challenges? Do you have an organization ﻿﻿to administer the funds? We can only give grants to charitable organizations or ‘qualified donees’ as defined by the CRA. Individual bank accounts cannot be used to administer funds. Call us and we will work with you to figure out a way to administer funds.